Chile Verde is my favorite dish in the 'Whole Wide World'. Chile Colorado is Ms. Goofy's favorite dish. The best place to get these two dishes is in Oakland California. Tijuana North this district has been called. La Estrellita Cafe is a great place to get both dishes. La Estrellitas's has close to 120 different tequilas. I have not tried them all yet. Tom was our Bartender. Tom has a very heavy hand on promoting Agave consumption . He gave us some killer chips and salsa to soak up some of the boozy tequila concoctions. The Verde salsa is to die for. We got our two plates and boy oh boy. I want to say it again. Boy oh Boy they were huge plates of Meat,Chile's,Rice and Bean's. This is everything the doctor ordered. We both left half our plate for another delicous meal. My lips are on fire and my belly is full. What more can you ask for. TALE GATING 101. You have to be at the ball park to have a true“Tail Gate Party”. Ms. Goofy and I had everything ready to go. We were on our way to the’ Oakland A’s versus the San Francisco Giant’s” pre-season game. Everything was ' Mise en place'. We are having Chicken Wings with Chipotle Honey Barbeque Sauce and Bacon Wrapped Asparagus. Everything is place and lightning strikes. The weather threatens and the sewer backs up. I will spare you the details. We had to salvage the day. We stayed at home , cooked our appetizers and did not pay 10 dollars for a beer. These two appetizers are the bomb. I hope you give them a try. Place all ingredients in blender. That’s it. Rub your wings with rub and barbeque over medium heat. When they are almost done, coat with barbeque sauce. Take 3 Asparagus Spears and wrap 1 piece of bacon around the spears. Take a skewer and secure bacon and Spears. Place in pan and marinade with rest of ingredients for at least 1 hours. Place Asparagus bundles on indirect heat for 10 minutes. It does not take a lot of time. We did not make the game but we sure scored some runs with the Crackerjack Appetizers!! "Tonight, we have a re-e-e-ally BIG SHEW!" On our stage tonight is a very Gifted and Talented Entertainer. Let me present a Friend and a Legend. "The Reverend Dr. Biggles." Picture a Norwegian Axe Murderer waiving at you. Dr. Biggles is here at Mad Meat Genius to bring you a most excellent slab of bacon. Holy crud Batman! It's almost exactly 2 years ago today that I posted CB's and mines Meat Adventure to Dittmers Wurst Haus in Mountain View. Dang, how cool is that? Lo and behold that's where CB and his wife Ms. Goofy meandered on down to a week ago. I remember waking up early Saturday morning to an email from him asking if I wanted anything from Dittmer's? Ha, YEAH I do! A slab of bacon and 6 garlic sausages please. He received the email in time. I was SET. The last slab I dove in to was good, but nothing to write home about. Good meat texture, decent fat to meat ratio, not much sugary cure and the smoke was light. But not this time, the smoke flavor was spot on. Not nearly as much as their double smoked pork loin, but right in there where you want it. The meat texture was quite firm and the fat stood its ground. When fried to a medium, no salty death. And the fact the slab comes in a little over 4 dollars a pound, I give it 2 Thumbsup with a broad smile to match. Where: Dittmer's Gourmet Meats & Wurst-Haus, Inc.
Thankyou Dr. Biggles!!! You can view more of the Reverend at Meathenge. I will be a new contributor to this food blog. It is a conglomeration of different Authors that write about grilling and related subjects. I will probably have two or so articles a month. I am very much jazzed about it. I am only an infant in the Blogoshere. This will be a fabulous opportunity to mature and become more comfortable in posting. I have been having a lot of fun these last two months. I want to thank Family and Friends for all the encouragement I have received. 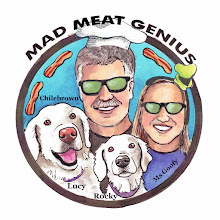 I have met some new people through Mad Meat Genius. I am grateful for their comments and support. Why is there a huge steak on the cover? I feel like celebrating. I would like a humongous steak for dinner. It is not going to happen tonight. I guess I will just have to look at a steak that was served to me at Alfred’s Steakhouse in the City. Alfred’s is one of my favorite steakhouses on the West Coast. When you walk into Alfred’s, it is like stepping back into time. I want to go out and buy a Fedora and learn how to smoke cigars. I am just waiting for Bogart to walk in. 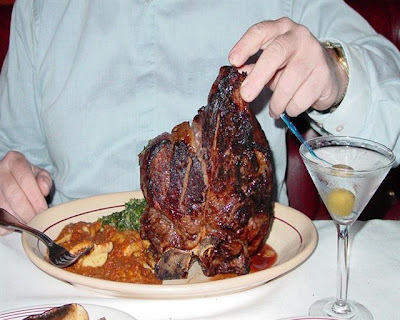 This steak weighed 64 ounces. It even has a name of the ‘Kingdom’. If you’re wondering if I ate it all, I did but it took three days. I just wanted to tell you about ‘Get Your Grill On”. Please come by and take a look. The Meat Adventure has only just begun. Hey, you ever break out into song? I am so excited I am going to sing. (Karen Carpenter). “ We’ve only just begun to live, White lace and promises, A kiss for luck and were on our way, and yes we have “, Hey Mojo & Oscar, GET OFF THE COUCH!!!!!!!!! Hey Mojo, Did you hear anything? Oscar, go back to sleep, Chile is on the computer. ‘Real Men Don’t Eat Quiche’. How many times have you heard that line? It always runs through my head when I break out the quiche pan. I think the saying should be changed to ‘Real Men Don’t Eat Brussel Sprouts.’ Well, that won’t work because; I have had Brussel Sprouts cooked with Bacon. I enjoyed it! How about, Real Men will not set the table with Cloth Doilies. Today I am making Asparagus and Beef Bacon Quiche. A simple pie dough has to be made. It is then filled with Eggs, Cheese and your choice of fillings. It is baked in the oven till it is ready to be displayed on your Cloth Doily. In a mixing bowl stir together flour and salt. Cut in shortening till pieces are the size of small peas. Add water 1 tablespoon at a time and mix gently. Form into ball and wrap in plastic and chill in refrigerator. Roll out your chilled dough to fit pie pan or quiche dish. Sprinkle ½ Cheddar and bacon in bottom. 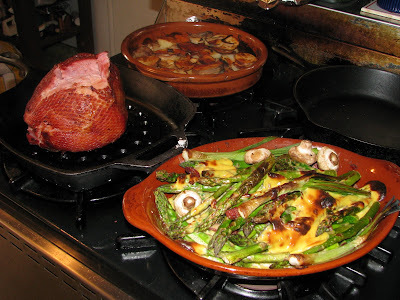 Arrange Asparagus to look like a wagon wheel spokes over cheese mixture. Sprinkle rest of cheese mixture over top. Combine eggs, milk, salt and pepper in a measuring cup. Pour this mixture over cheese and asparagus mixture. Sprinkle the parmesan cheese over top. Bake in 325 degrees for 35 to 40 minutes. The quiche should be slightly brown and the eggs should be set. You can insert a knife and if it pulls out clean you’re done. I really do not have anything against cloth or paper Doilies. If I had any I would probably use them. I think, maybe! Schinken Speck, Schinken Speck, Schinken Speck. Yeah, I got you huh? This is the act that has been in the Green Room for the bacon theater. This is a heavy hitter. It is a double smoked Pork Sirloin. It is from the best Meat Market in the Bay Area, Dittmer’s. You may be wondering why Emeril is the background. I have no idea! Well maybe because this bacon is kicked up several notches. It is the smoke Bomb! This is already cooked so you just need to add just a little bit to your dishes. I do not know if you can call it a true bacon (Cookiecrumb). It is definitely something special. I have not fried it so I can not tell you about the texture. I did put some in Scalloped Potatoes and some Asparagus. It just rocked both dishes. It is a little salty. It has smoke for a new generation! The fat to meat ratio does not really apply on this little gem. It is going to receive a 4 out of 5 stars. 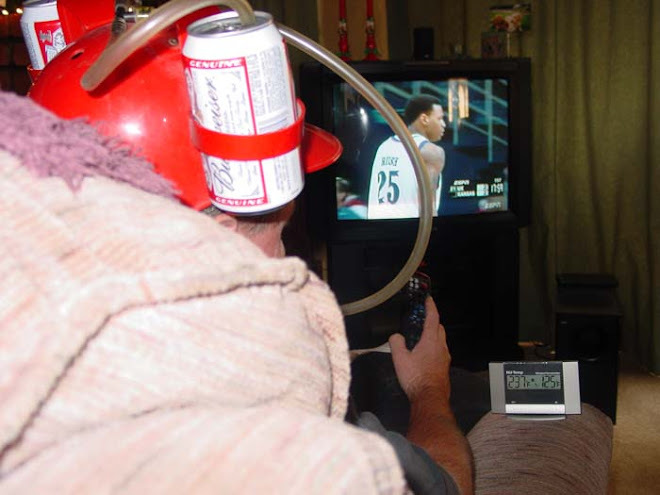 There is no reason to adjust your T.V. set. Yes, you read correctly. 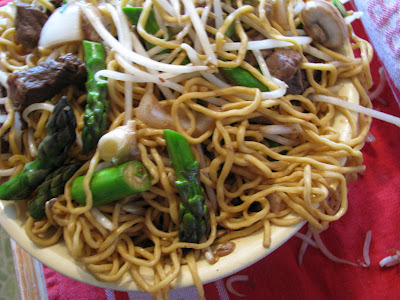 Barbequed Chow Mein with Asparagus and Beef. I have a fancy gadget made by Weber for a Weber. It is a Wok insert that is built to fit your Weber barbeque kettle. Asparagus is in season and I am, “Radio goo-goo,Radio ga-ga” over the Green Shafts of Spring. I made a short trip to our local International Market to buy fresh Chow Mein noodles and then to the Farmers market for asparagus. I add some marinated beef and a few other ingredients. It is a fairly simple recipe. The secret is in your preparation. You need to slice, chop, marinade, precook and put everything in place. (Mise En Place) Toss everything in your Wok and cook away. The first step is to marinade the beef. 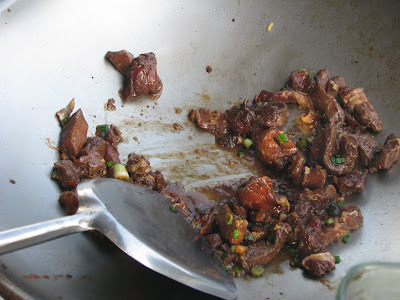 Take a large zip lock bag and add your beef, garlic,2 tablespoons green onion, sherry, ginger sugar, 1 tablespoon of corn starch and ¼ cup soy sauce. Mix and place in refrigerator for a couple of hours. Boil your noodles in salted water. When they hit the surface, take them off the fire and rinse under cold water. The secret to Wok cooking is to have all your ingredients ready. Chop and slice all the vegetables and place next to your cooking area. Put all the ingredients back in the Wok with bean sprouts, stock,cornstarch,1/4 soy sauce and cover with lid Simmer for 10 minutes. You have one great Chow Mein. Ms. Goofy wanted a Ham for Easter. She wanted something special. I suggested our local Mega-Plaza-Food-Emporium. They had Ham on sale for 49. cents a pound. If you have a coupon, you could get two for one. She suggested we try a ‘Mini Meat Adventure’ and travel down to Dittmer’s. I said I would only agree, if I did not have to wear the Big Bunny Suit tonight. Oh well, off to Dittmer’s we go. Dittmer’s is located in Mountain View, Ca. It is in a small strip mall about a mile off the main freeway. When you get out of your car the first thing you notice is a smokehouse smell. Something good inside is waiting for you. When you walk in there is mass of people waiting for sandwiches and meat products. You take a number and wait for just a minute or two. We had to get out of the rotation because we could not decide on, over one hundred products made on premise. I introduced myself to Mark. He told me about the Schinken Speck. He got excited about telling me about it. After tasting it I know why! You will learn all about it in a future ‘Bacon Revue’. He gave us a bunch of samples. We browsed a little more and got to meet Mark’s dad “Dittmer”. The way I understand it, that is his first name. Rock Stars and Killer Meat men only go by their first name you know. He is a Rock Star. Mark and Dittmer’s have the best Meat Market in the Bay Area!! Dittmer’s has a lot of German products like mustard, pickles, preserves, spices, etc. for sale. They sell sandwiches. The list of meat products is overwhelming. They have a slough of awards. We left with a ice chest full of smoky goodness. I cannot wait till tomorrow to have our ham. I do not have to wear the Bunny Suit tonight! I have two Golden Retriever Lap Dogs. It is a rare breed. They weigh close to 90 pounds a piece. It is a good thing I have a big lap. They are very spoiled. Ms. Goofy boils chicken thighs to supplement their dog food. She doesn't boil chicken thighs for me. Actually Ms. Goofy is a very good cook. Her specialty is Italian Food. Oscar & Mojo are the boy's names. They are avid gardeners. They are constantly preparing the soil for planting. I wish they would stop preparing spots in the middle of the lawn. When they want a snack they will not just settle for 'Bacon Bits' the artificially flavored dog snack. They want the real thing. Mojo is getting ready for his afternoon snack in the picture. Let the show begin, in the Bacon Theater. Beef Bacon from Gartners is on stage today. Gartners is located in Portland Oregon. It is full service Meat Market. The market is huge. There is a whole drove of people working the counter. They have some sort of meat product for everyone. They even have bones for your dog. That is if your dog is part Wooly Mammoth. This hunk of cured beef is some of the last, of my stash from the Meat Haul. The Meat Haul from the “Ultimate Meat Adventure” held last summer. 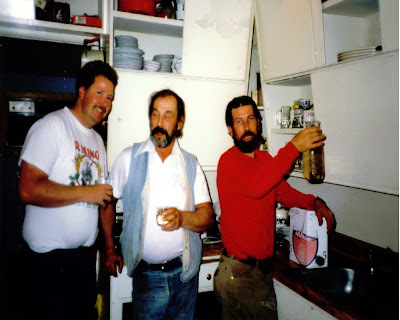 It is almost time to start planning a new Meat Adventure to replenish the Chilebrown Ice Cave. I am going to start out with the texture. I have cooked it to several different degrees of doneness. Every way I cook it, it turns out tough and chewy. I think Jerky should be tough and chewy. The salt level is present, but not overpowering. The meat to fat ratio is good. I taste or smell no smoke. There is a pronounced beef flavor. This may be the problem. I think bacon should have a pork flavor. I am going to have to give this bacon an overall score of 2 stars out of 5. This has been the lowest score in the ‘Revue’ so far. It is not a great representation of the Gartners Meats. Next up,will be Gartners Sugar Bacon. Ron Green grows Cauliflower. It is beautiful. He lives right in town on the upper crust of the Bay Area. He is an Urban Local Farmer that grows lots of vegetables for people that might not recieve fresh produce. In the summer he has tomatoes, cucumbers and the killer squash. Most of his vegetables, all of his vegegatbles are given away. He is a hero!! Are you wearin the Green? I have a we bit of Irish in my background. I always claim a little more around this time of year. I no longer drink Green Beer, but, I do have to have my Corned Beef. This year I am going to prepare the brisket with a little twist. I have received my inspiration from Larry Gaian. This Corned Beef will be ground, stuffed, tied and smoked. The Corned Beef I am using is called the Point Cut (also know as the Deckel). It has more fat and is usually less expensive than the Flat Cut. I am going to trim away as much fat as possible and replace it with Bacon. This will be ground to a coarse mixture The stuffing will be a Mushroom, Shallots, Garlic and Cheddar Cheese mixture. The meat and filling will be shaped into a log and wrapped with Caul Fat. What is Caul Fat? It is a lacy fatty membrane that encases the internal organs of an animal. It is not as gross as it sounds. It will hold everything together. By the time everything is cooked the Caul Fat will have melted away. Make sure your Corned Beef is chilled. Trim away as much fat as you can. Slice into strips so it will fit into your Meat Grinder. I am using a Kitchen Aide Mixer with a meat grinder attachment. Use the coarse grind die and grind the beef and the bacon together. Mix together and chill. Take some oil and heat in a skillet pan. When the oil is hot add the garlic and shallots. Cook for several minutes and add mushrooms. Cook until mushrooms have given off their liquid. Chill this mixture. Now that the mushrooms are nice and cold, mix with cheese. Use a large piece of parchment paper and spread your meat mixture into a rectangular shape. Lay cheese right down the center. Lift the edge of the parchment paper and roll mixture into a log shape. Seal all the edges by patting meat together. You do not want any cheese to escape. Lay your Caul fat on a cutting board. Place meat log in center. Wrap the Caul Fat around the mixture. You then need to secure it with some string. It is a good thing that I was a Boy Scout a long, long time ago. Put Meat Log back into refrigerator. I will be smoking the Log with Applewood in the Rocky Mountain Smoker. The ideal cooking temperature will be 225-250 degrees. It will take aprox 3 hours or until the internal temperature of the meat is 165. When you are measuring the temperature make sure the probe is in the meat and not the cheese center. I cannot stress the importance of this next step. When you have removed your meat from the smoker let it rest. Let it rest for at least 40 minutes. If you do not let it rest, the cheese mixture will just ooze all over your cutting board. Just like I did. It was delicous! It is that time of year that Asparagus is hitting the stores and farmers markets. The Chilebrown household will probably have some sort of Asparagus dish on the weekend for the next two months. It will be made into Soup, Chow Mein, deep fried, baked, boiled, steamed, barbequed, quiche and my favorite bacon wrapped. The flavor of these Green Spears of Spring will be at their best for the next few months. After the season is over, I will have to go cold turkey, like an addict. Yes, My name is Chilebrown, and I am an Asparagus Freak. I just wanted to warn you of the Asparagus fun to come. Speaking of Asparagus fun, the Asparagus Festival is right around the corner. It is to be held in Downtown Stockton, Ca. April 25-27. This is an event not to be missed. Martin Yan will be giving a cooking demonstration. He is always entertaining and usually gives a 'R' rated version of his act. There will be an Asparagus eating contest. Joey Chestnut a World Class Trencherman will be competing. Greg Kihn, Joan Jett and 'War' will be performing. The most important part of the festival will be the food. The Deep Fried Asparagus is something not to be missed. They even will have Asparagus Ice Cream and Asparagus Margaritas. Hope to see you there!! Jalapeno, Cauliflower, Cheddar soup how can you go wrong. This used to be a signature dish at Buffalo Bills in the 80”s. It is now a signature dish at the Chilebrown house. I am going to add a ingredient that you might not like. It is Velveeta Cheese. I know that a lot of you will turn away, Velveeta cheese actually melts and tastes okay, I have used good Cheddar and it will separate. Am I wrong for using Velveeta? I do not think so. Fry the bacon till it cry’s that it wants’s the onions. Add everything else except the cheese.. Simmer for 15minutes. Add Cheese and turn down the heat. 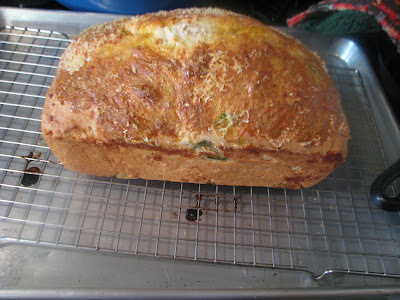 Jalapeno, Cheese Bread was served with the soup. We are having a Jalapeno Cheese kind of day. It also helps when you make a stock with leftover Smoked Turkey Bones . Why do you have to eat Turkey only on Thanksgiving? Isn’t Turkey a big ole chicken? People eat chicken everyday. Why not Turkeys? It is supposedly good for you. It is low in fat. Depending on what side dishes you accompany it with, it could be considered health food. In the Chilebrown kitchen, it is the Smoke Bomb. I am firing up the smoker and smoking a Turkey with Apple wood. 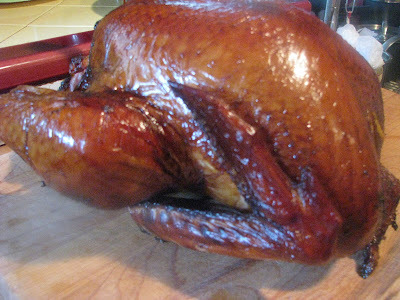 I have brined the bird for 12 hours in a salt and sugar solution. I will be smoking the gobbler for less than 4 hours. Let’s start with the brine. I am cooking a 12 pound Turkey. This recipe just covers the top of the bird. You can adjust the recipe as needed. Let brine for aprox 8 hours. Overnight is the perfect time. The next step is to set up the smoker. I am using the Weber Rocky Mountain Cooker. The bird will be cooking at a high heat.(350-400). It is not cooking at a low heat (225-250) because there is really no benefit to the lower temperature when cooking a bird. The Turkey will have a crisp crust . It will be smoky and be tender. Welcome back to the Bacon Theater. Today we are trying bacon from Eden Farms. Eden Farms is located in the Upper Midwest States and consists of 28 farm families. 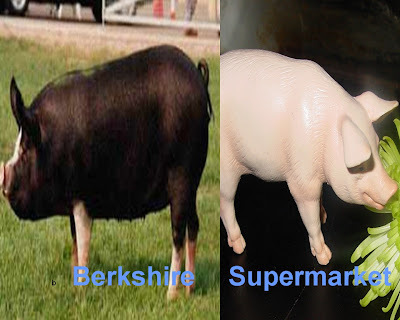 They raise Hogs from the Berkshire Breed. These Hogs are fed corn and soybeans which are grown on the same farms. These pigs are not given hormones or antibiotics. When we are Revue(ing) bacon, we look for several things. The most important is the taste. Does it taste good? We look for the smoke equation. Does the smoke grab you? Is the bacon salty? The sweetness factor is one of personal taste. The texture of the bacon can be fickle. If you over cook bacon it will have the texture and taste of charcoal. I try to cook the bacon to the point it has achieved color and is just starting to crisp. What is the meat to fat ratio? These are some of the things we are looking for. Eden Farms bacon is a mellow bacon. It is not salty, sweet or smoky. It does have a great taste. It has a taste like the pork chop your mom used to make you. Let me try to elaborate and show you a picture of the two. 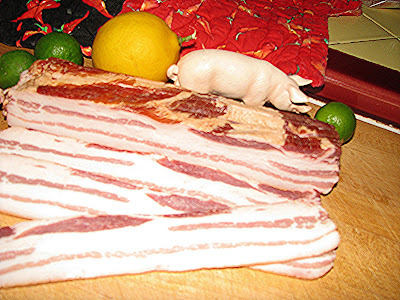 When you have Supermarket Bacon, it grabs you with smoke and salt. That is all you taste. Ms. Goofy has prepared some bacon wrapped cream cheese filled jalapeno's for the smoker tomorrow. Barbeque is a serious business to a lot of people. I feel it is my duty to try every barbeque establishment in the Bay Area. I have enlisted help in my QUEst. We have organized barbeque crawls. They are way to much fun. One BBQ place stood out on our adventure. This place is a step above the rest. It has been consistently good every time I have visited . This smoke palace of meaty delights is called Memphis Minnies. Memphis Minnies is located on lower Haight St. It just happens to be across the street from the Toronado Pub. The Toronado has 50 or more beers on tap. It is a destination in itself, but that is another story. Memphis Minnies is not a large place. What they lack in size is made up with colorful decor and great food. Walking in you will go by a counter showcasing the meats and side dishes. You step up to the counter and place your order. The hard part is finding a place to sit. The place is usually packed. The Beef Ribs are some of the best I have ever had. 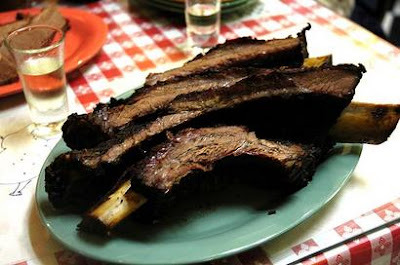 It is hard to find a Meaty Beef Rib. These ribs must of been taken from a prehistoric Fred Flinstone type steer. They have been coated with a dry rub and have been smoked over a green almond wood. This meat is falling off the bone. At each table there is a choice of three barbeque sauces. There is a tomato , vinegar,and mustard base sauce. You can go to the cashier and request the hot sauce. The brisket is moist and juicy. It has the perfect smoke ring. The pork ribs have just the right amount of smoke. I ate it without any sauce at all. Ms. Goofy had a pulled pork sandwich. I am not sure how she like it because she was moaning, slurping and licking her plate. (and then mine). The side dishes are plentiful. All the side dishes are made from scratch. The cornbread was just out of the oven. We did not make it to the desserts. Memphis Minnies serves Anchor steam on tap and has a collection of Sake. Sake sounds a little unusual, but it goes well with barbeque. The owner Bob Kantor is Sake expert. We met him on our crawl. He is a dedicated and passionate man. His love for this restaurant shows.There is a Saturday and Sunday Brunch. We will return to try the "Barbequed Pork Rolls w/ chipotle chili dressing" and everything else. Anybody interested in "Barbeque Crawl"? This Sunday we went on a mini Meat Adventure. We ventured over to the City to visit Avedano's Holly Park Market. It is an old fashioned real life Meat Market. I discovered this place through a magazine called "meatpaper". This magazine is a new publication that is all about meat. You know I had to subscribe. Avedano's is located in the Bernal Heights district of San Francisco. It is a funky old neighborhood which has turned into a trendy and urban chic destination. There are plenty of boutiques, cafes and coffee shops. There now is Avedano's. It originally opened in 1901 and was called Ciero's until it closed in the 80's. Three women (Tia Harrison, Angela Wilson and Melanie Eisemann) are the present owners. It is everything you would imagine of an old butcher shop. When you walk in you will notice a bull inlayed in the floor tile. It is very clean and tidy. There are old pictures of Ciero's displayed on the walls. The meat display cases have a selection of Beef and Pork, often from local farmers and producers. Everything is natural (no hormones,antibiotics), free range and or grass-fed. There is Kobe Beef, Buffalo Rib Eyes and duck. There is something for everybody.